What makes this traditional kriek special is that it is brewed with whole cherries. Since real Schaerbeek cherries are scarce, Lindemans Brewery has found their perfect equivalence elsewhere in Europe. It is deep red in colour and its foam head is slightly pink. 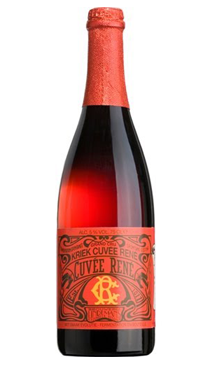 Very refreshing, this beverage is a perfect thirst-quencher which, thanks to its fizzy and tangy flavour, is ideal as an aperitif.” In order to produce Old Kriek Cuvée René, the cherries ferment in a lambic that is at least six months old in huge 10,000-litre oak barrels called foudres. After six months, this traditional kriek is bottled in corked 75 cl bottles. The beer will then undergo a spontaneous second fermentation process which, after a few months, will produce the carbon dioxide (CO2) to which this authentic beer owes its carbonation and distinctive foam head.